There is something inherently magical about a letter. It’s tactile communication – paper touched by the hand of another, tucked into an envelope that traps their air inside and transports it to you. I find it fascinating, and even slightly romantic, that we still lick envelopes to seal them shut. In a sense, peeling a letter open is like a kiss on your hand. Letters have a cadence that facilitates a reply, built right into the structure. Not only do you tell the person how you’re doing, what you’ve seen, how you feel, but inevitably you also ask the receiver of the letter about his own well-being. And then, contrary to every modern impulse you have, you wait patiently for a reply. The anticipation is part of the joy of the sending. When I was a kid I collected postcards. Most of them are blank, souvenirs I picked up in gift shops or brought back to me from friends or family. But flipping through my collection today, I found a few that were actually mailed to me. A handful are from Elodie, a French girl we hosted one summer when I was nine or ten. She sent the family a postcard from each destination she traveled to on vacation – a stunning pink sky against the pristine snow of Val Thorens, shop lights reflected in the harbor of Saint-Tropez, fireworks over the Eiffel Tower. 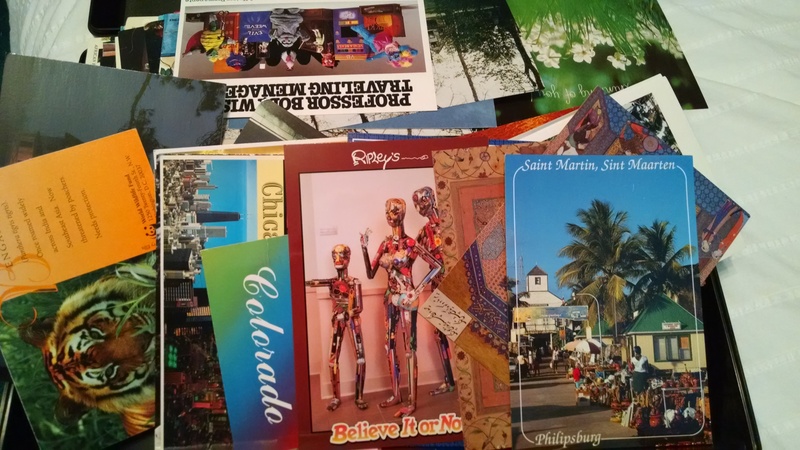 Some of the postcards function like time capsules, capturing little moments that would have otherwise been forgotten. A friend on vacation writing to see if I want to go to the movies when he returns home; a mentor on a business trip describing the museums of Paris; greetings from a Polish girl I met at summer camp. 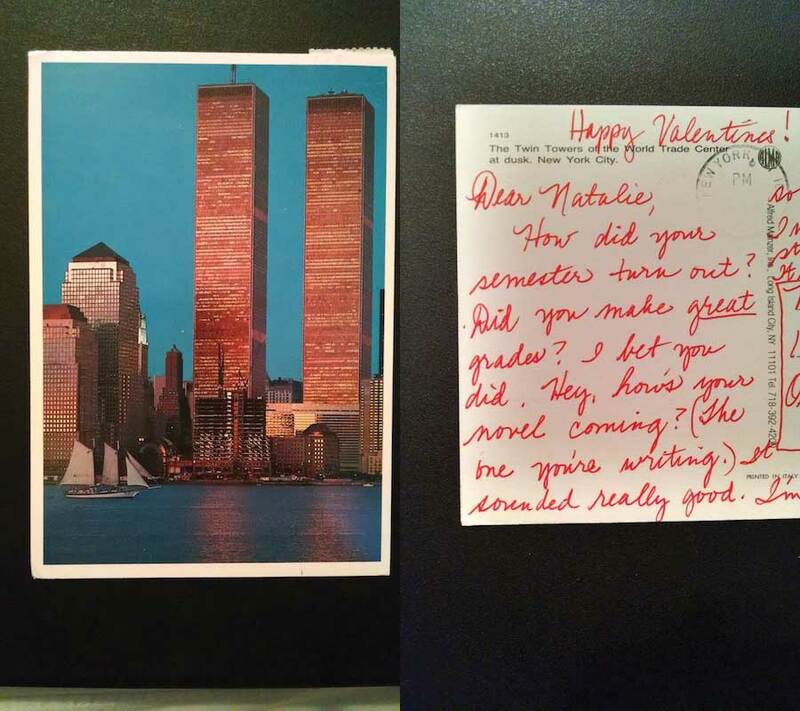 The one that struck me in particular was a postcard sent to me from New York in 1994, the Twin Towers bathed in copper light. The writer is someone named Christina, though I can’t remember who she is or where I met her. She asks how my novel is coming along. I don’t remember that either, but apparently it sounded really good to her. 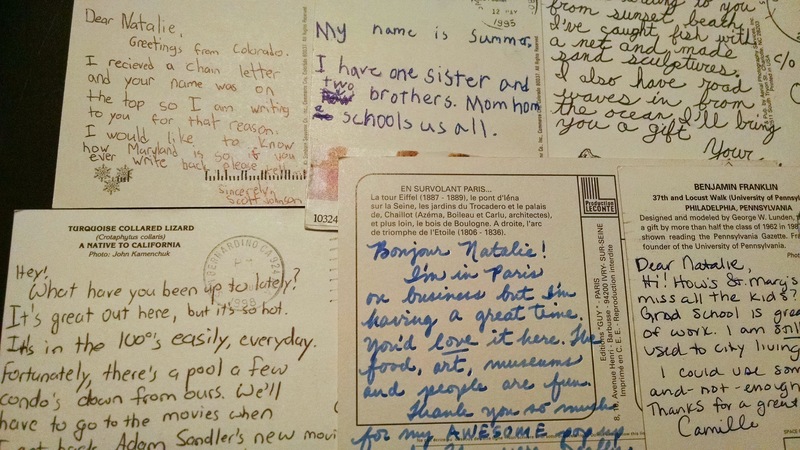 In fact, a few of the postcards are from pen pals – perfect strangers who received my name and address through chain letters. These days we’re all so guarded, so private, that the idea of giving out an address sounds like a crazy risk to take. But when you think about it, it’s really not such sacred information. Not only are most of us listed in the phone book, but the phone book is now an online database with address, map, and even age. As an experiment in personalizing the cold reaches of cyberspace, I’m going to ask you to send me your address. With the request comes a promise of handwritten correspondence. A letter, or a postcard, or a drawing, or maybe even a box, sent to you from me. This invitation is open to friends and strangers alike, in the hope that I can keep the magic of the mail alive. You can get in touch with me using my contact form (and I sincerely hope you do).